It's always a gift when details about someone best known for their work, rather than the details of their life (or how that life influenced their work), come into view. Yoshitaka Amano: The Illustrated Biography, originally in French by Florent Gorges and now published in English by Dark Horse, works both as a welcome peek into the life and times of one of Japan's most fabled living illustrators and designers, the man who brought to life the looks of Vampire Hunter D and Final Fantasy, and as a general introduction to his artwork for those who haven't yet had it. But in truth the latter is more readily served by way of other books — see Yoshitaka Amano: Illustrations, for instance. The greatest value of this book is in giving us the details of Yoshitaka Amano's life and professional career that were either scattered far and wide, only available in Japanese, or related by way of third parties instead of in Amano's own words. Just having it all in one place at last, with his voice at the center, is service enough. The book follows a fairly standard approach for a biography of a living figure — a chronological walkthrough of Amano's life, followed by some insights into his current work habits and perspectives on his growth. From early on Amano was fascinated by and absorbed in the process of creating, and he had great freedom in his childhood (marred chiefly by the death of his father, a lacquerer) to explore those things. Post-WWII Japan was flush with new kinds of diversions, like the rental bookstores that had their own species of manga, and Amano doted on the contents but especially on the elaborate and detailed cover art. This detail resonated with me personally; with me, it was the cover art and interior illustrations of magazines like OMNI that fired my own curiosity and imagination as a kid. I got the impression Amano gleaned different things from each art form that became part of his signature style: from manga, Amano learned how art could have great spontaneity and energy; from the covers, the detail and painstaking craftsmanship that could draw in the viewer ever deeper. Formal art training did nothing for Amano. He wanted to create, not copy other work and wait for approval. Impulses like this led him to apply in his early teens to the animation studio Tatsunoko, rather than continue school (which he was doing poorly in anyway). To his amazement, he was not only accepted but welcomed in, and was quite doted on by Tatsunoko head Tatsuo Yoshida. Under him, he began as an animation assistant — a grueling and not particularly creative job — but graduated from that to character design work. Many shows from the Tatsunoko mill in the 1970s — Gatchaman, Casshan, Time Bokan — used Amano's characters. The pressure to keep coming up with new character ideas was draining. Worse, Amano felt like he couldn't unleash the full range of his work in that form — character designs had to be kept simple for TV, and they could only be seen in their full form in stills or promo work. With Yoshida's death in 1977, Amano felt something in Tatsunoko generally had died. By 1982 — after fifteen years there — Amano was ready to go freelance. It's this part of Amano's career that most people who know his name are at least distantly familiar with. Amano's freelancing started with the then-prestigious monthly S-F Magazine, where he contributed an interior illustrated section called "Twilight Worlds" — almost like a wordless manga — and eventually cover art as well. 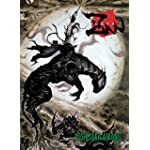 Work on the Vampire Hunter D light novel series started shortly after that; one of the surprises about that project, known to me before but always enjoyable to read about, was how author Hideyuki Kikuchi's original vision for the character didn't resemble Amano's design at all — but how Amano's version lionized everyone's imagination before long, including Kikuchi himself. Amano's takeaway from all this, and a key to his character generally I think, was not that he could get away with such things, but that he had to be on guard against getting in the way of someone else who was just as much a creator as he. He made a point of only taking total liberty when it was explicitly given to him, as when he did highly interpretive cover art for a set of reissues of Edogawa Rampo's novels. Many of Amano's other commissions for works in series aren't well-known outside of Japan, although the works associated with them do ring bells for some here. Light novel series The Legend of Arslan, best known now by way of the recent manga and TV anime adaptation of it (by way of Fullmetal Alchemist creator Hiromu Arakawa), had its original designs and interior illustrations courtesy of Amano. Another one, Guin Saga — a favorite of mine, now likely never to see more than a few volumes in English — had many of its later volumes sporting Amano covers. Another project of Amano's from this period did nothing for him at the time, but has since cemented his stature as a gifted visualizer: the film Angel's Egg, created in collaboration with Mamoru Oshii. Oshii was himself a Tatsunoko alumnus, and after a couple of false starts the two were able to land the financing for the film from Tokuma Shoten on the pretext that the artbook associated with it would be part of the overall marketing. Japanese audiences were bewildered, but it found adoring fans in France, where animated art and boundary-pushing experimentation had long enjoyed a thriving audience. But again, Amano quickly understood his role was that of an inspiration and a source, and he was able to subordinate his contributions to the needs of the team. At first, it was mainly for the sake of promotion, as he was told, "We first want the children who will play to escape into your illustrations on the cover and in the manual. Your illustrations are going to make their trip to our pixelated worlds more exotic." Another note that resonated with me personally; how many games had I played as a kid where the box art had been as cherished, if not more so, than the game itself? But even when technology advanced to the point where it could have replicated Amano's work faithfully, it was used more as a starting-gun inspiration for the rest of the work rather than the goal to be achieved. And again, Amano wasn't dismayed by that: "I never felt frustrated by an unfaithful adaptation from paper to pixels," he said. For him, Final Fantasy was just one of many avenues to express himself. The book notes that Amano is slowly turning away from external commissions to give himself more time to produce personal projects — e.g., the gorgeous storybook Deva Zan — but less out of arrogance and more out of a simple need to see what else was possible. Amano will even confess that there were many times when he refused surprise invitations from his friends during the weekends or vacations if he was in the middle of a drawing. It was impossible to get him away before he was finished! His brother Takashi, ten years older, also worked in a paper factory, and did not hesitate to bring home for him very large and immaculate sheets. A godsend! On the other hand, maybe this kind of floridity is less of a problem for someone of Amano's temperament. His life has not been marred by tremendous controversy or aesthetic contradiction, so it doesn't feel inappropriate to be this celebratory, just occasionally awkward in its puppy-dog level of affection. This attitude of Amano's, his self-effacement and humility, is something I can confirm for myself, if only in miniature. When Amano visited New York City for New York Comic-Con some years back (Kikuchi was also there; it made for a great joint appearance), he wasn't at all the austere figure his art would suggest. He was lively, warm, always engaged and curious, and he gave me a gift (a limited-edition shirt) that I still cherish. Those who look up to artists as heroes are always cautioned about meeting them, for fear of discovering feet of clay. But it's always heartening to know someone whose talent shone light into your own life is in fact a decent and curious human being, and this book offers its own evidence for all of those who haven't been lucky enough to know for themselves.